Drain and pat dry the mozzarella balls. Place flour in one bowl, breadcrumbs mixed with marjoram (or oregano) in second one. Using a fork beat the egg in a small bowl (you can add about a table spoon of milk to be sure you have enough for 20 balls). Place a mozzarella ball in the flour and coat evenly. Shake off the excess flour. Now dip it into the beaten egg again making sure it is covered evenly. Take out the ball using a fork and place it in the breadcrumb mix. Cover well. 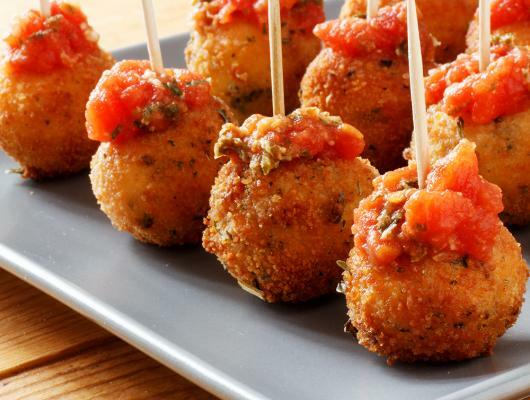 To make sure the mozzarella cheese won’t leak out when frying, cover again in egg and in breadcrumbs. Transfer onto a plate. Put all mozzarella balls into the freezer for 15-20 minutes. Prepare the sauce by placing all the ingredients in a small sauce pan (except for the basil, parsley leaves & parmesan cheese). Bring to the boil, reduce the heat and simmer for about 10 minutes. Add some water if too thick. Add finely chopped herbs and finely grated parmesan cheese. Mix well. Simmer for a further minute. Remove from the heat & let it cool a bit. Now heat up a saucepan filled with oil. Take the mozzarella balls from the freezer and once the oil is hot enough slowly drop them in. Be careful as it will take only a minute or two for them to get nice golden colour!Transfer on a kitchen paper towel to get rid of the excess oil. 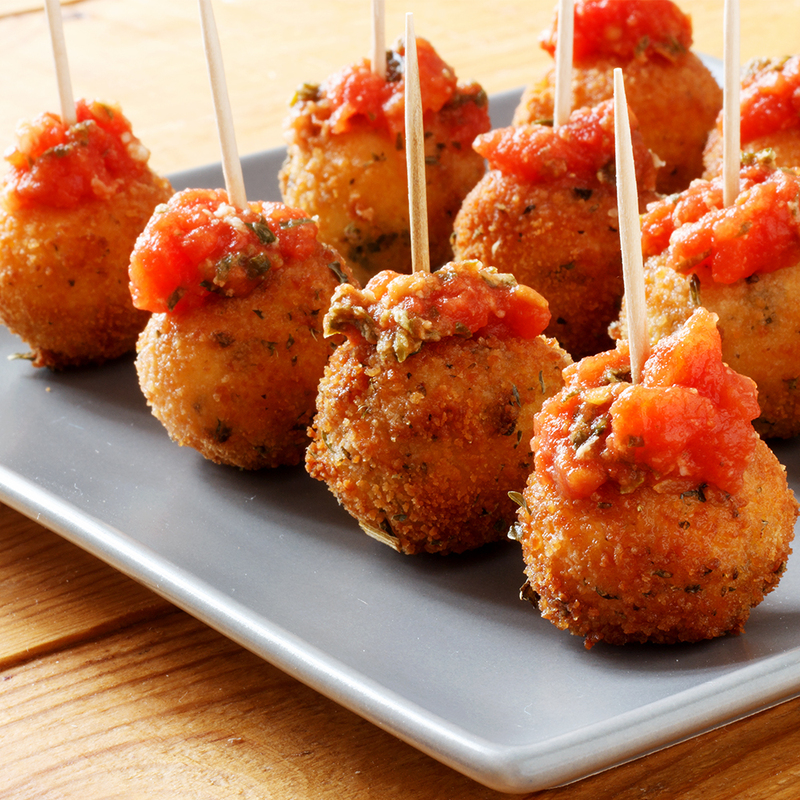 Serve with homemade tomato sauce as a party snack or appetizer. A week or so back I had a chance to taste fried mozzarella balls with tomato sauce. These were served to us alongside with some other deep fried appetizers. The mozzarella balls were absolutely divine and I knew back then that I would be trying to copy them and get as close to the delicious flavours as possible. I haven’t even done any research related to this subject. I have to say that there was no reason for that as I had had the picture in my head for a good while and knew that it would simply be about improvisation. Anyway, what can go wrong here, right? I think I have succeeded and I am happy with the look and the taste of both the sauce and the balls. This is a pretty simple recipe and it really is worth the while (not that it takes long to make these)!